In February 2018, Gerald was diagnosed with a Glioblastoma Brain Tumor. Since his diagnosis many have wondered how they could help and here is one way. 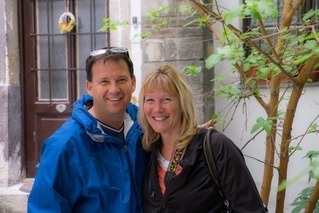 For over 30 years Gerald and Donna have used their home as a place of ministry. They have opened the doors for Young Life students and staff to come and go all hours of the day and night. They have made people feel welcomed and loved. Their home has served as their place of ministry and many of us have been transformed by their ministry. While I was visiting colleges, my dad and I visited Texas A&M. The night before our campus visit, we spent the evening at Gerald and Donna Garcia’s home where I had the opportunity to see them open their doors and host dozens of college students from A&M. From the outside, their house looked like many other houses in College Station, but on the inside there was something uniquely transformative happening. Students were reciting the book of James from memory, they were worshiping with freedom and excited to dive into the Word together. What was happening was more than a Bible Study, it was a community. Because of the love Gerald and Donna had for these students, their home was—and is--a safe place for all to grow in Christ. It’s not a stretch to say that thousands have been impacted by their ministry. If you are reading this, you are likely one of those people. A group of friends have gotten together with the hopes of raising enough money to pay off Gerald and Donna’s mortgage and cover their property taxes for the next 10 years. By doing this, we will allow Gerald to focus on healing and ministry. Friends, would you partner with us in launching Gerald and Donna into their next season of ministry through a gift of any amount?